Although constrained by local codes, K-Build expanded the owners' vision and totally revitalized their home. 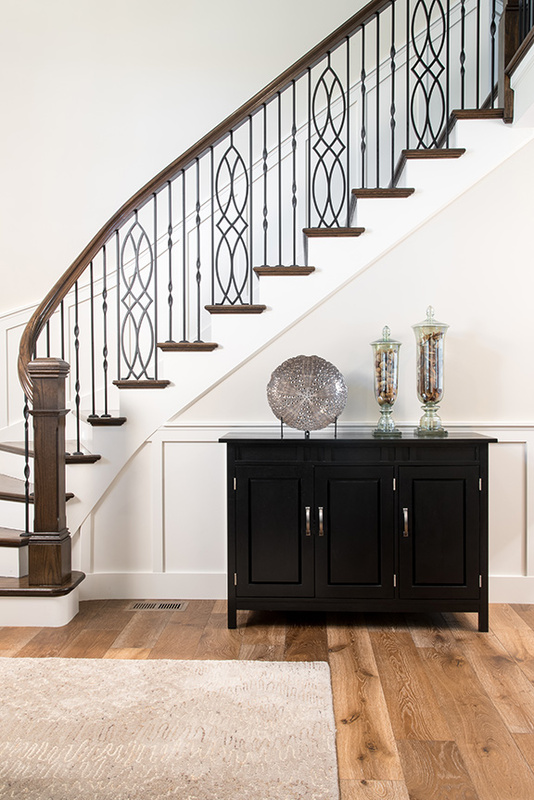 The homeowner collaborated with Kirkwood Stair & Millwork to design the main staircase, a graceful curve of red oak with decorative wrought-iron balusters. Originally the step-down family room, the master bedroom has an exquisite fireplace surrounded in split-face limestone. On either side, former storage cabinets were converted into additional closet space. 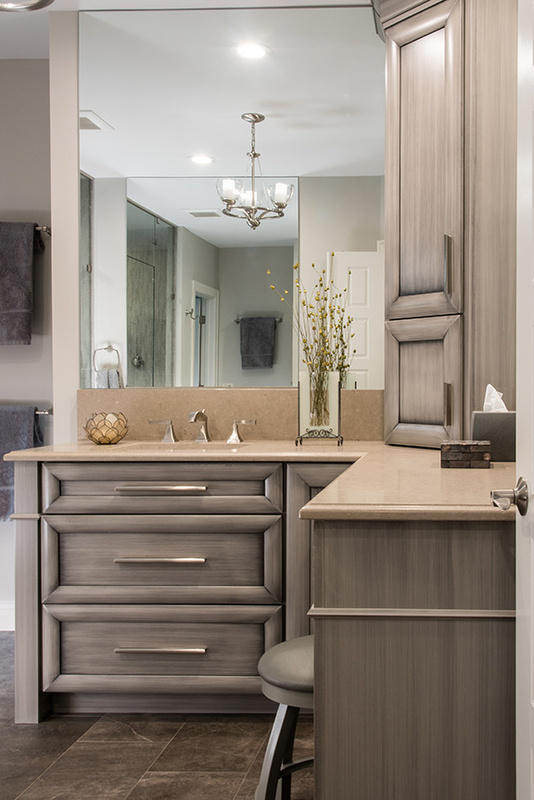 Custom-edged quartz tops the master bath cabinetry, finished in a brushed cocoa/gray glaze. 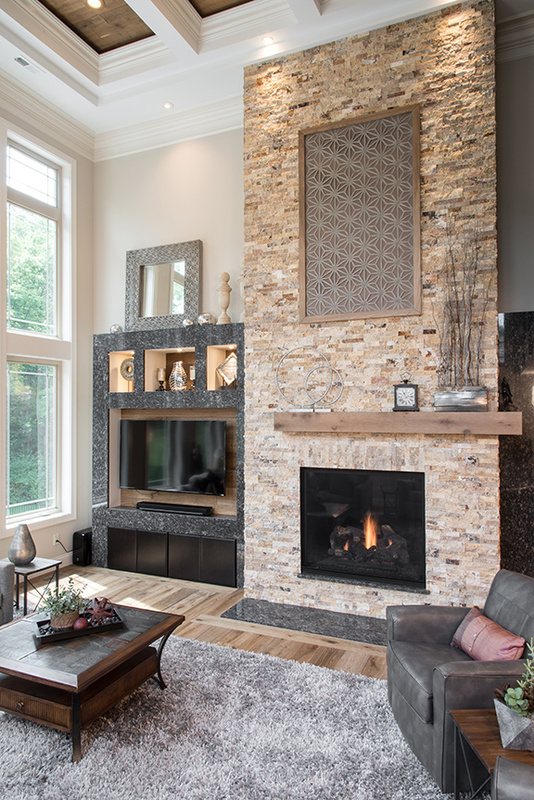 Highlights of the newly-added great room include Craftsman-styled windows, K-Build's trademark "waffle" ceiling, and the stacked-stone fireplace, positioned off-center and flanked by a custom, granite-faced display unit from Russo Stone and Tile Design. A 6-foot casual dining island separates the open kitchen area from the great room, and the massive, traditionally embellished work island incorporates a GE induction cooktop. Both islands are richly appointed in Oyster Bay granite and stained maple with a brushed glaze. Sue McCann of Henry Kitchen & Bath designed the kitchen layout, patiently modifying the plans as the wife came up with new ideas. 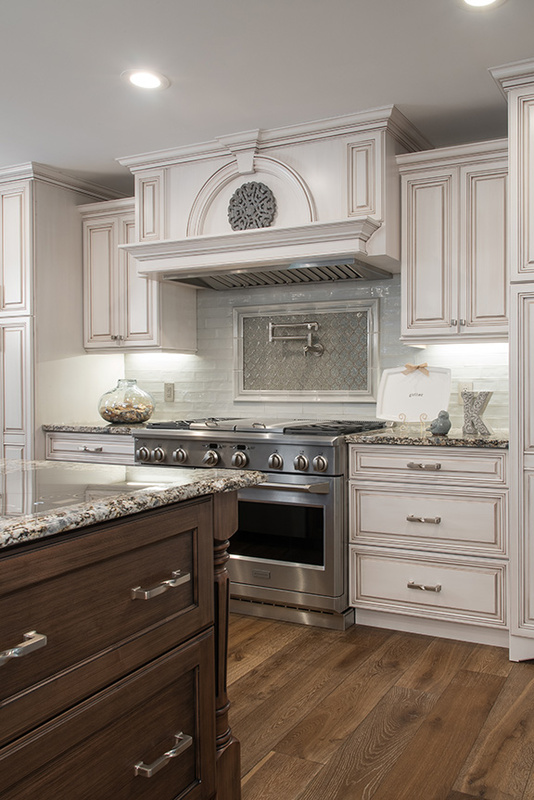 The finished product includes beautifully detailed cabinetry with stainless pulls, a 4-burner GE Monogram range with griddle and grill, and an elegant custom range hood. Set among the trees in a quiet Town and Country neighborhood, the traditional two-story was a good fit for the family of five when purchased in 2001. There were four bedrooms upstairs, and the main-level floor plan was fairly innovative for a home built in 1979. 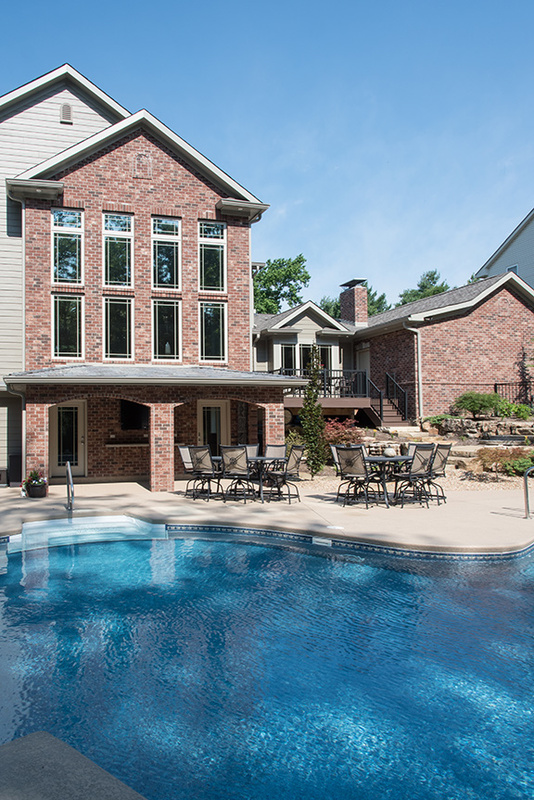 Soon after moving in, the new owners made a few updates and added a pool, but decided to postpone major renovations for a more convenient time in the future. Life was full; the years went by; and in 2014, with their three sons now grown, the couple revived their plans for remodeling the kitchen and adding a great room for entertaining. A family member recommended K-Build, an award-winning local design/build company, for the project. And in the homeowners’ own words, “Things snowballed from there.” The end result was a stunning full-home renovation and a remarkable builder/client relationship that led to one rather surprising consequence. Local building codes, however, presented a major challenge. To comply with statutory easements, the new plan would have to stay within the basic frame of the house, which was essentially “boxed in” on three sides. Expansion to the rear was permissible, but limited by the already-installed swimming pool. Undaunted, K-Build responded with an ingenious design that achieved the owners’ objectives, while fitting into the allowable space as neatly as the pieces of a jigsaw puzzle. 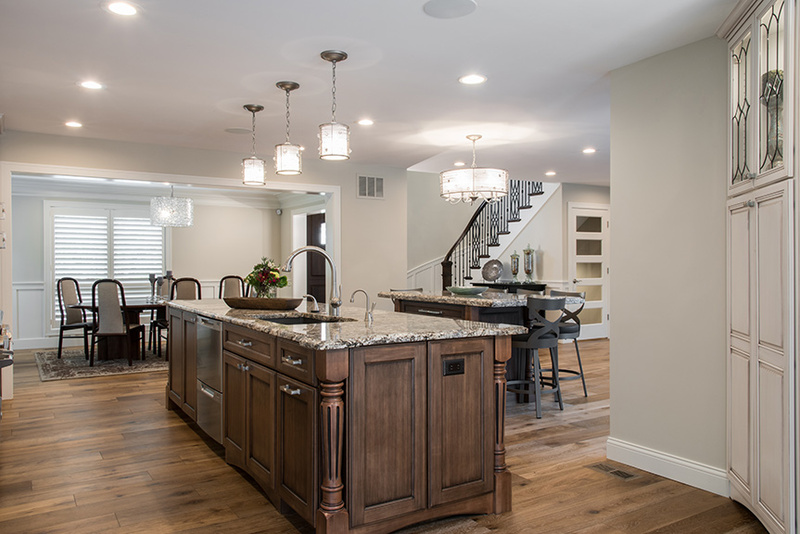 Energy efficiency was a priority for the homeowners, and K-Build oversaw the installation of all-new electrical, plumbing, and 4-zoned HVAC systems. The side-entry garage was expanded to accommodate four vehicles, and the entry foyer was raised to two stories, with lavish amounts of stone and an elegant mahogany door adding glamor to the elevation. Inside, the stairway to the upper level presented another code issue, and the wife joined forces with Kirkwood Stair to design the graceful curved staircase in wrought iron and oak. Upstairs, the bedrooms were enlarged, creating a loft and converting the four bedrooms to three, one of which serves as a home office for the husband, an account manager for a biotech company. On the main level, the activity spaces were completely rearranged. Walls were removed, the headers lifted to eight feet, and wide-plank French oak flooring laid. Opening the exterior rear wall, a steel beam was installed to provide structural support for addition of the new two-story great room and upper-level loft. Lined by floor-to-ceiling, Craftsman-styled windows, the great room is definitely the home’s showpiece. A K-Build trademark, the coffered “waffle” ceiling soars to 18 feet, and K-Build went a step further in this case, adding oak inserts for contrast. K-Build's interior design emphasized texture, using various materials and finishes to transition smoothly from one space to another. After vigorous discussion (won by the ladies), the great room’s stacked limestone fireplace was positioned off-center and flanked by a built-in, custom-designed display unit, faced in gleaming granite that matches the hearth and wraps around the corner leading to the kitchen. Further linking the elements, the mantel and backdrop for the flat screen TV are oak, and overhead, the loft’s fireplace is also stacked limestone, with a wrought-iron railing identical to the foyer staircase. In the wet bar, Omega cabinetry from Henry Kitchen & Bath is finished in a creamy brushed glaze and accented with leaded glass, Oyster Bay granite countertops and a glass tile backsplash. 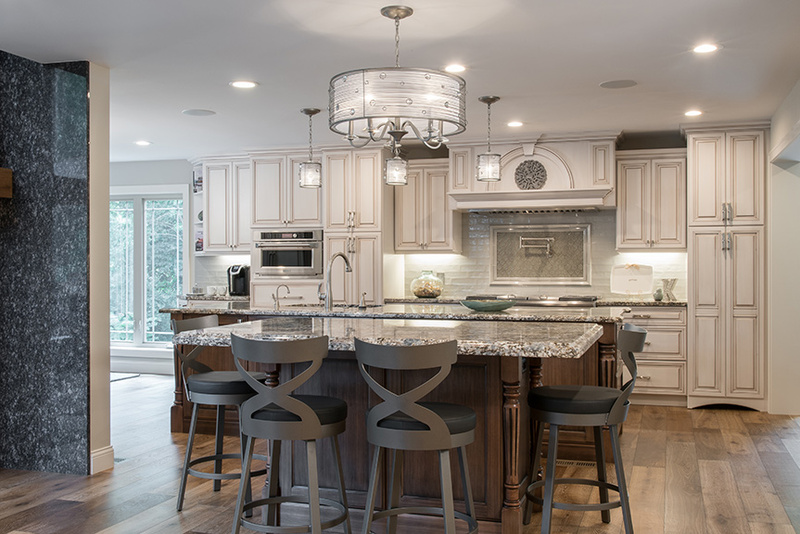 The transitional theme is carried through into the kitchen – a voluminous space designed by Sue McCann from Henry Kitchen & Bath and filled by two large custom islands with bases in brush-glazed stained maple, fluted embellishments and Oyster Bay granite surfaces. The casual dining island defines the kitchen area and, nearly 11 feet in length, the work island includes the sink and an induction cooktop. Completing the décor are stainless GE Monogram appliances, a beautifully detailed custom range hood, stainless cabinet pulls, and pendant lighting. Extending from the kitchen, the wife’s open office offers lovely views of the pool area, and at the front of the home, the formal dining room was retained but reduced in size, consistent with today’s more casual lifestyle. In the opposing wing, another dramatic change was made to the floor plan, converting the original step-down family room into a sumptuous main-floor master suite. 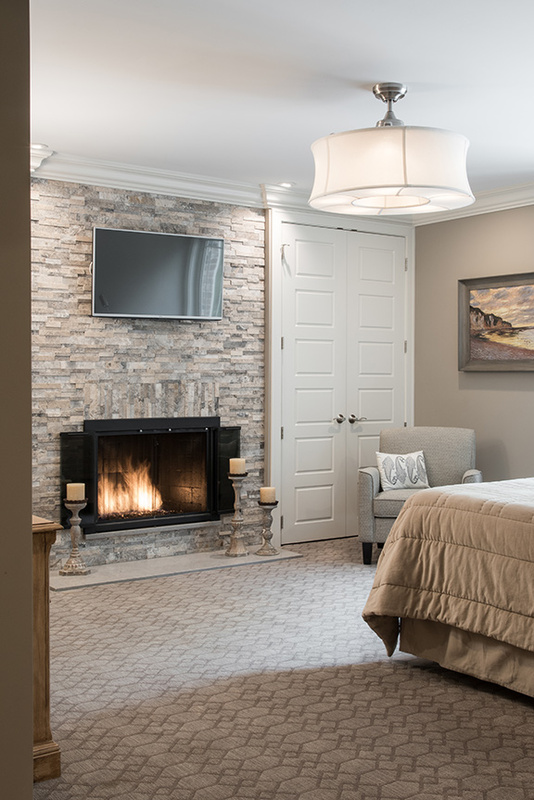 Soft gray walls and cut-and-loop carpeting in a textured geometric pattern lend warmth and intimacy to the bedroom, and the fireplace is surrounded by smooth, split-face limestone, with a quartz hearth. On either side of the fireplace, what had been cabinets were expanded into closets, adding still more storage space to the room-size walk-in closet opposite the luxurious master bath. Resembling polished concrete, the bath’s porcelain floor tiles are complemented by quartz-topped cabinets in a brushed cocoa/gray glaze, and the spacious, glass-enclosed steam shower is equipped with a bench seat and three showerheads – one fixed, an overhead rain shower and a hand-held rain shower. Brilliantly designed, this extraordinary residence is proof of K-Build’s commitment to “quality, superior craftsmanship, and attentive client communication.” Now completely revitalized, the home is everything its owners could have hoped for – and more! Oh, that “surprising consequence” referred to earlier? Formerly an elementary school teacher, the wife so thoroughly enjoyed collaborating in the creative process that she was lured back into the workforce and now does cabinetry design for a local remodeling firm.